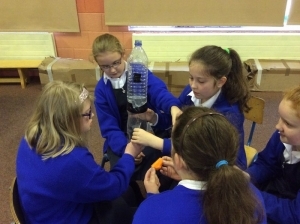 St. Aidan’s N.S took part in Science Week from 9th – 15th November. 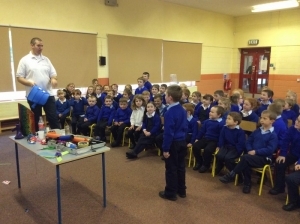 As part of Science week, Science Ireland visited our school on Tuesday 10th November. 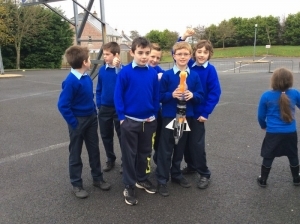 Fifth and sixth class pupils worked in teams and made their own rockets. They then tested their rockets outside to see which one went the highest. Senior Infants and First Class explored forces. Here we see a ping pong ball being kept in the air with a hairdryer. 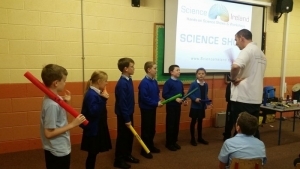 Third and fourth Classes did some experiments based on sound. It was great fun ! 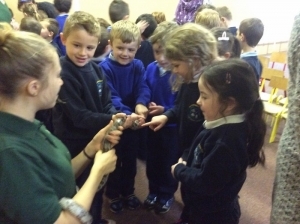 On Thursday, Kiltimagh Pet Farm brought some animals to our school. This visit was organised by Bank of Ireland as part of Enterprise Week. The children really enjoyed holding and learning about the different animals! 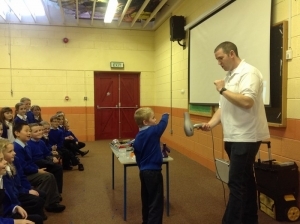 On Friday, Third Class hosted a Science demonstration in the school hall for the Junior Classes. 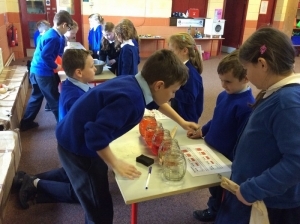 All pupils were given a chance to work on experiments. They even invited parents to try some!